KickSat’s Zac Manchester poses with the mothership. Back in 2011, Zac Manchester launched a Kickstarter for hundreds of small satellites, to be programmed by backers. 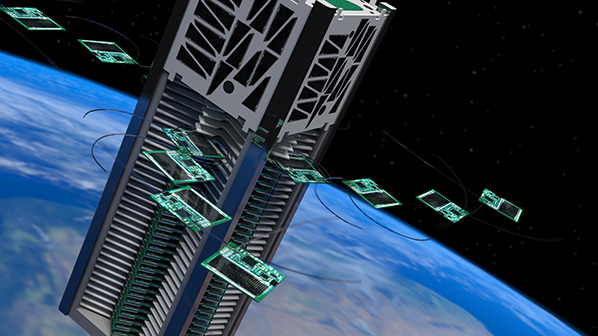 The Sprites, as these little “chipsats” are called, would be packed into a CubeSat, via a mechanism built by Andy Filo, and launched aboard SpaceX’s CRS-3 rocket. The project got delayed, then delayed again. But with an official launch date slated for this coming Monday, we caught up with Manchester and Filo to talk about citizen space exploration, the maker movement, and how they work together. Editor’s note: The KickSat team is looking for people to listen to their satellites next week. The Sprites will only be aloft for a few days, and they want as many data points as possible. On GitHub, Manchester has posted instructions for how to build a ground station and track Sprites on your own. It’s easy, he says; get involved! KickSat is scheduled to launch on Monday. How do you feel about it? Andy Filo: We’re keeping our fingers crossed. Anything can happen. We’re very excited. The vehicle we’re on, CRS-3, is a really cool vehicle to be on, but it’s also had a lot of delays. So we’re about a year out from where we’d originally hoped to launch from. Zac Manchester: There have been many, many delays. This is just kind of par for the course in aerospace. Launches always get delayed, that’s just the way it goes. It’s not really anybody’s fault, it’s just, technical things come up. Space is still hard and exotic and all that. And it’s still kind of a big deal. It’s not the sort of daily or even weekly or monthly occurrence where things go off on regular schedules. There’s a few launches a year and they’re often fraught with all kinds of uncertainty and crazy things happen and that’s the way it is. I think that we’re hopefully getting to a place now where these things are more regular, becoming more routine, and things are getting easier. That’s definitely happening with a lot of the new commercial space stuff. Not that there hasn’t been commercial space stuff for decades, but I think there’s a new focus on it, and new types of people getting involved. So it’s going to become more and more routine, I think, which is a good thing. People like makers are seeing this become an actual possibility. ZM: Yeah, makers, and there’s now a whole bunch of Silicon Valley startups. There’s more players getting involved, and I think that is going to lead to lower costs and more frequent launches. With CubeSats, which is what we built for KickSat, there’s kind of a standard in terms of what the thing has to look like, the dimensions, how much it weighs, and then there’s also standardized testing. The way I see this going, you buy a kit and you build your little satellite and then you send it off in the mail and it gets launched by somebody who will integrate it with a bunch of other tiny satellites and launch them together. It’s not an easy process to go through, and I think that streamlining that and making it work better is going to be an important thing in the next few years, as more people try to do things in space. AF: The one takeaway from everybody who’s gone through the process is, space is hard. People are currently talking about, how do we reinvent space, how do we make space more accessible? The programming is set up to be very Arduino-like. The schematics and the data to build the satellites are posted on the Github website, so if someone’s ambitious and they want to build them, they actually can. How did you get involved? What’s in your background that made you want to create something like this? ZM: I’m a long-time space nerd. I got a degree in applied physics at Cornell, and I got involved in this stuff as an undergrad, as a junior. This ChipSat idea has been floating around for about 10 years, and our group at Cornell has been kind of pioneering it. I came in at the right time when the technology was just getting to the point where we could actually build these things, cheaply, with off the shelf parts — mostly because of smartphones. Almost all the parts on the ChipSat are from the consumer electronics industry; they’re the sorts of things that are on smartphones. And most of these parts didn’t exist more than five years ago, so it’s just the right timing where there’s all these sensors available, all these things that you can buy for $2 on SparkFun, and they’re just the right kind you need for a satellite. AF: I did the mechanicals of the KickSat, coming up with how the actual KickSats would be held into the frame, how they would be deployed, and even how to spin them up. We actually used the antenna as a spring that deploys the ChipSat and puts a spin on it. It keeps them sun facing. This has been a technique that’s been used in satellites since the early days. A spring mechanism is a cheap and reliable way to store energy, and to impart spin, to give it stability so it’s just not in a tumble when it comes out. In our case, we have solar cells, and we want them to be sun-facing. And also by having it in a stable manner, it’s radio transmission is relatively consistent, as opposed to being in a random tumble. The mission profile is to launch the mothership and have it deploy in a stable manner, and then to deploy the ChipSats. They have a magnetometer and a gyroscope on them, so what they measure is any magenetic flux that’s changing in the upper atmosphere (low earth orbit). And there’s drag from our atmosphere, so even though you’re in space, atmospheric drag is still a significant factor. It hasn’t deployed yet, but at least on the ground phase and the testing phase, we were able to leverage 3D printing to come up with a deployment mechanism that would be reliable, that could withstand the vacuum and the temperature extremes of space. On Kickstarter, you raised nearly three times your goal. Did you have to adapt to be able to incorporate a whole bunch of extra sprites? ZM: Yeah, we built a bigger satellite is basically what happened. Initially, we benchmarked the CubeSat standard, which is what KickSat is — it’s sort of a mothership for all the sprites. 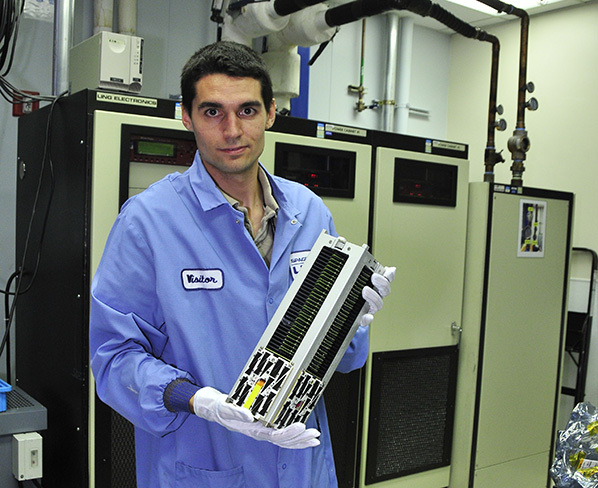 That standard comes in units; a 1U or one-unit CubeSat is 10 by 10 by 10 centimeters. They go in increments of that 1U size, so you can have a 1U, a 2U, a 3U CubeSat. When we ended up with the extra money, we built a 3U CubeSat instead, and fit more sprites in. AF: Originally, every launch vehicle had dead weight in it, used to trim the flight characteristics. Usually it’s a piece of lead or titanium or something, and sometimes it’s ejected, sometimes it’s not. But someone said Hey, instead of carrying up dead weight, why don’t we carry up really small satellites that weigh the same amount? So that’s where the whole CubeSat and the form factor and everything came up: Why don’t you take up something for the betterment of mankind? NASA actually mandated that every launch vehicle that they charter has the ability to deploy satellites from them. How are people using your Sprites, or what will they be doing once they’re up there? ZM: one of my favorites was the British Interplanetary Society; a group of guys there got together and got a developer kit and came up with a pretty cool experiment. They’re taking data from a random number generator and filling the RAM on the microcontroller with that, and then reading it back a little while later, and just kind of repeatedly doing this, looking for bit flips. They’re basically turning the RAM on the microcontroller into a radiation detector. It happens on the ground, too: High energy particles from cosmic ray-type radiation will go in and flip bits in your RAM. On the surface of the Earth, that’s very rare, but in space, when you’re out of the atmosphere and there’s more radiation, it’s much more common. They’re not using the sensors that we deliberately put on there for people to use. It was a clever little alternate usage for the hardware on there. But still, the Sprites are pretty limited. I noticed on your Kickstarter you had mentioned doing something more elaborate in the future. Are you still thinking about a version 2.0? ZM: Oh yeah, for sure. 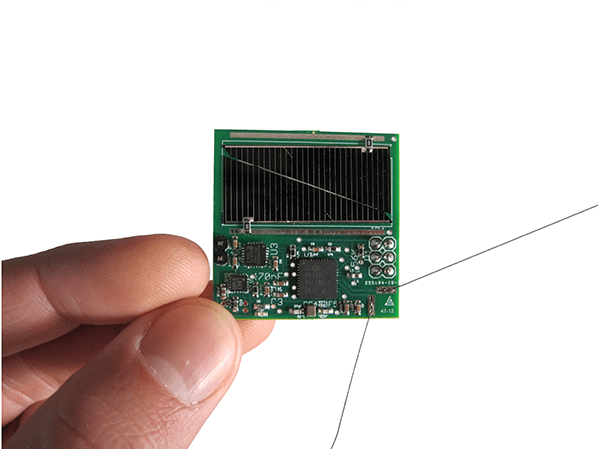 The whole idea here is to create a general purpose, open-source platform for these tiny satellites. So I want this to become sort of like the space Arduino, if you will. It’s a platform that you can put your own sensors on and write your own code on. And it’s something that you can hack on and build yourself, like in a basement workshop, for not a lot of money. We’re getting to a point where, in the next couple of years, it’s going to be realistic to have a sub-thousand-dollar satellite mission, so that a hobbyist or high school class could get a kit and put together something like one of these, and get it launched. I just think putting it in more people’s hands, and having people hack on it, and mess around with it, and come up with new ideas, is a powerful thing. Right now it’s really hard to put things in space, as evidenced by our experience and the experience of a lot of other people who have been trying to launch amateur satellites for the last several years. Like I said, it’s not a routine thing, it’s still kind of an exotic thing, and it’s expensive. AF: That’s why we’re doubly excited about this. They’re both demonstration missions. The CRF-3 first stage is going to demonstrate reusability. It’s not just a one-shot component that is going to be recycled. These components are actually designed to be flown 10, 20, 30 times before they wear out. Basically, it’s Elon Musk’s SpaceX vision to have a 100 percent reusable launch vehicle. And so the first stage actually has functional landing legs on it. When it’s launched, the first stage will actually do a gentle return to earth. Their vision is that it will lower launch costs by a factor of 200. That’s why we’re excited about it — what we’re doing is making space accessible by using Moore’s Law. He’s making space accessible by lowering the cost by having reusable vehicles.